A post office opened here in the mid 1860s and settlement is thought to be earlier. 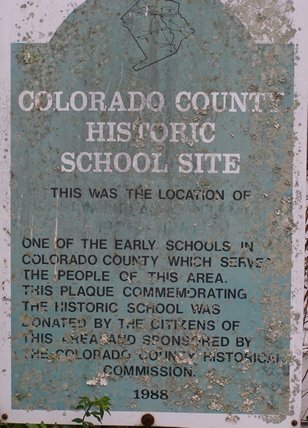 A school built in the 1870s had 32 students by the end of that decade. By 1880 the post office had closed its doors and the mail came through Weimar. 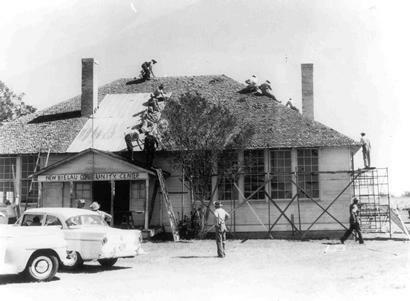 By 1940 Content was just the school and a few residences, even though over the years it was nearly self-sufficient with its own stores and essential businesses. Content was hampered in growth by its proximity to Weimar and its nearby “sister-town” of New Bielau. New Bielau shared churches and a school board with Content. Today there is no town “center” discernible –but the New Bielau-Content community center and the Trinity Evangelical Church provide the local landmarks. The Rev. 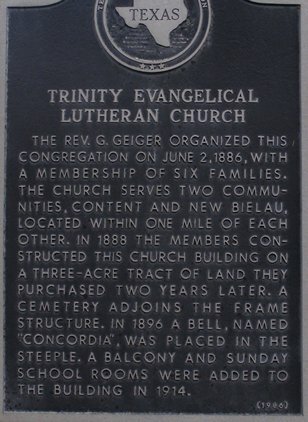 G. Geiger organized this congregation on June 2, 1886, with a membership of six families. The church serves two communities, Content and New Bielau, located within one mile of each other. 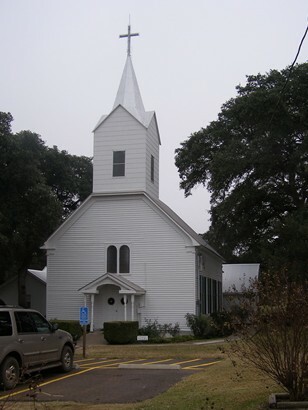 In 1888 the members constructed this church building on a three-acre tract of land they purchased two years later. A cemetery adjoins the frame structure. In 1896 a bell, named "Concordia," was placed in the steeple. 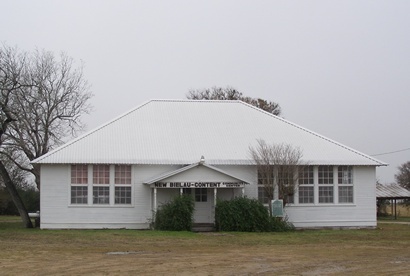 A balcony and Sunday School rooms were added to the building in 1914.